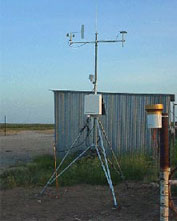 An automated weather station network in New Mexico provides real-time weather and evapotranspiration data via the Internet. The network was installed in 1983 and consists of nearly 30 stations. The stations monitor relative humidity, temperature, soil temperature, solar radiation, and wind speed/direction. Current and historical data can be accessed from the New Mexico Climate Center website. The website also interactively calculates ETo from the archived data for user-specified time periods.